The nearest designated parking area for blue badge holders is on Bethwin Road, approximately 35 meters from the main theatre entrance. The route involves crossing the road and there are no adjacent dropped kerbs up to the pavement level. The closest parking bays to the theatre are on Thompson Avenue adjacent to cycle racks. These are not blue badge bays but are on the same pavement side as the theatre. If you have questions or concerns about access to the theatre, please call 020 7701 0100 to discuss your requirements. Our licensed bar serving hot and cold drinks and snacks is open an hour before the performance. For food, Pasha Hotel has an offer to ticket holders of a 10% discount & free glass of wine with your pre or post show meal. 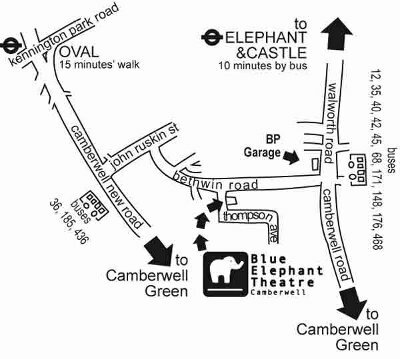 They can be found a few minutes walk from the theatre, at 158 Camberwell Road, London, SE5 0EE. Call 0207 277 2228 to book and we advise leaving about two hours for a meal. Google map of the walk from the theatre.